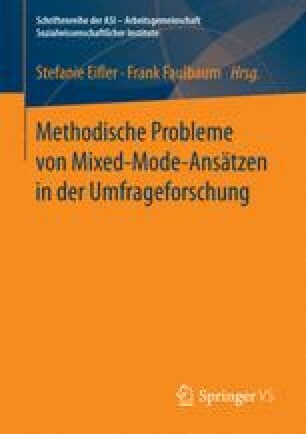 It has often been noted that survey methodology is inherently pragmatically oriented (e.g., Bosnjak and Danner 2015, p. 309; Goyder 1987, p. 11): How to sample and recruit respondents to reduce coverage and sampling errors, how to operationalize concepts to reduce measurement error, and how to minimize the differences between those who responded from those who did not on all variables of interest (i.e., nonresponse bias) are generic guiding questions in survey methodology (Dillman et al. 2014; Groves et al. 2011).